WALNUT -- Opponents were seeing red, lots and lots of red. With the letters GO on bright red singlets. It stood for Great Oak, but it might just as well have meant "Go Great Oak." Go they did as both the boys and girls teams from the Temecula school captured the Team Sweepstakes for the fifth consecutive year Saturday at the Mt. SAC Invitational, one of the key meets that separates the contenders from the pretenders looking forward to the state championships in Fresno five weeks away. Coach Doug Soles' clubs made a major statement despite some of the runners still feeling the effects of chest colds. 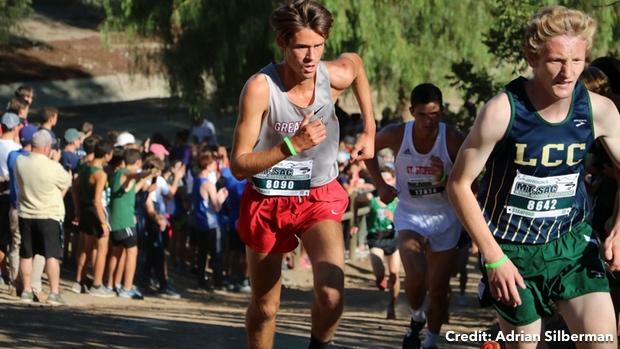 With Tyler Tickner's second place finish at 14:44.7 over the hilly, challenging 2.93-mile course leading the way, the boys low-scored Carlsbad La Costa Canyon 50-113, placing three runners in the Top 10 and six among the Top 20. On the girls' side, it was Tori Gaitan's runner-up finish at 17:02.2 that saw GO blanket the Top 10 in red, finishing 2-5-8-9 and with a 20th, score just 44 points -- 46 better than Anaheim Canyon. "We have a standard we have to uphold," said Soles. "We've had a lot of sickness lately but the kids powered through. We did what we expected in both the boys and girls races." The words were spoken matter-of-factly as the Wolfpack have become the state's dominant power and showed it again. "This is basically the group that won the freshman National Championship in dominant fashion four years ago -- it's the legacy of Great Oak," said Soles. "Both teams are still jelling. This is one of the road markers to see where we are but I'm very pleased placing six girls in the top 21. "It's good to see our boys do well because our runners 4 through 7 have been sick. And our 5 and 6 girls runners are closing in on No. 4, which is what we want for state." Gaitan let LCC's Kristin Fahy, one of the nation's top runners who has committed to Stanford, get away from her on the hills and could not reel her in as Fahy ran a personal-best 16:50.4, the fastest time of the day. "If anyone was going to beat me, I'm glad it was Kristin because she's great," said Gaitan, a junior. "I'm disappointed I didn't run faster because my PR on this course is 10 seconds better. I'll use it as a motivation for my next race. "I was happy the team ran so well. I won this race a year ago but the most important thing is how the team ran." As for Fahy, she said the Mt. SAC course is one her favorites because she likes the hills, of which there are plenty. What she didn't think about is that it was on this course less than a year ago at the Foot Locker Western Regionals where she was forced to stop when a T-Band on her leg got too painful to continue. "I hadn't even thought about it but when I was at the top of Reservoir Hill, my coach (Bill Vice) said something about the race a year ago and then I thought about it," said Fahy. "Truthfully, I don't even think about what happened a week ago let along a year ago. This is a new year and I'm just concerned with how well I'm running now." Which is quite well as her time was a four-second improvement and the fastest time of the day. As for the boys, Tickner could still say he was the fastest Californian in the race as Crayton Carrozza of St. Stephens Episcopal in Austin, Texas, was first across the finish line in 14:35.3. "I wanted to take it right after Poop-out (the first of two late-race hills) and I did that," Tickner said. "I think I pushed a little too hard up Poop-out and ended up paying the price for it in the last 400. Regardless of that, it was a great race. Hat's off to the guy (Carrozza) who finished killer in the last 400." Making Great Oak's boys' decisive victory even more impressive was that runner-up La Costa Canyon is Division II in the state, so the nearest Division I team was No. 3 Long Beach Poly, almost 100 points behind at 145. "I think we're a better hill-running team (the state meet course is fairly flat)," said Soles. "Our goal, though, isn't Mt. Sac, it's CIF and State." But as it has been the last four years, impressive wins by both teams at Mt. SAC could well be a portent of things to come in late November.